Hillsboro’s Mason Swayne stiff arms a Clermont Northeastern defender on Friday at Richard’s Memorial Field in Hillsboro where the Indians battled the Rockets in high school football action. 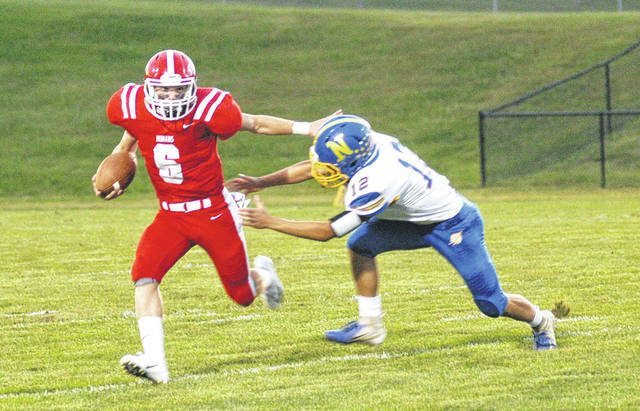 The Hillsboro Indians celebrated Homecoming on Friday when they host the Rockets of Clermont Northeastern at Richard’s Memorial Field in Hillsboro. The Rockets received the initial kickoff and started the possession at their own 35-yard line. The Indians defense came out ready to play as Luke Middleton dropped the ball carrier for a loss of 12 on the second play from scrimmage after a fumble on the hand off by the Rockets. Hillsboro forced a three and out by CNE and returned the punt to their own 46-yard line. On the very next play Mason Swayne faked a hand off to Keets and got to the edge for a scintillating 45 yard run to the Rockets nine-yard line. From there Deon Burns took over with two consecutive rushes, including a 4-yard plunge for the first score of the night for Hillsboro. The extra point attempt by Reece Bloomfield was good and the Indians led 7-0 with 8:58 to play in the first quarter. The Indians’ defense continued their strong play as they forced another three and out by the Rockets as Josh Keets came up big defensively on second and three for CNE as he engulfed the ball carrier in the backfield for a 4-yard loss. On the ensuing Hillsboro possession the Indians fumbled twice as Swayne fumbled and recovered on first and ten before Mark Gallimore fumbled on the next play and it was recovered by the Rockets. Clermont Northeastern put together an 11 play drive and managed to get inside the Indians 20-yard line. However, a fourth down attempt was no good by the Rockets and they turned the ball over to Hillsboro on downs. Hillsboro possessed the ball through the end of the first quarter but were unable to get much going as they punted to give possession back to CNE. The Rockets continued to struggle against the Hillsboro defense as they were forced to punt for the third time in the game. Hillsboro took possession at their own 25 and were able to make their way to midfield before a fumble that was recovered by the Rockets and an official spotted lightening in the distance and signaled for the teams to head to the locker room with 7:15 to play in the first half. Following the 30 minute delay the Indians picked up where they left off as they forced a fourth three and out by CNE in the first half. On the ensuing drive for Hillsboro Swayne was able to complete his first pass of the season to Middleton for 48 yards to the Rockets 30-yard line. Keets took the handoff on the very next play and rumbled 30-yards for the touchdown. The point after try was no good for Bloomfield but a flag against CNE resulted in a five-yard penalty and allowed Hillsboro to run another play. This time Hillsboro elected to go for two and Keets took the hand off and rushed into the enzone to give Hillsboro a 15-0 lead. The Indians added a third touchdown early in the second half as Keets again took the ball 30-yards for the score and Bloomfield converted the point after to give Hillsboro a 22-0 lead. The Rockets were able to garner one touchdown in the third quarter but overall the Indians’ defense played their best game of the season. Keets added a third touchdown in the fourth quarter, this on going for 39-yards, as he juked defenders left and right on his way to pay dirt. The score and point after provided the final 29-7 score as the Indians moved to 5-0 on the season. Hillsboro will be back in action next Friday when they host the Chillicothe Cavaliers in their first Frontier Athletic Conference game of the year.